As a nation, we’ve always been interested in home improvement. The satisfaction you get by making your home more beautiful and more convenient has universal appeal. Even the downturn in the housing market hasn’t stopped homeowners from remodeling kitchens and bathrooms, replacing worn carpeting, repainting rooms and installing crown molding. Made from recycled newspaper, cellulose insulation can be blown into attics and other spaces to improve energy performance. Sealing leaks and adding insulation. The typical house has far too many air leaks and far too little insulation. As a result, certain rooms are unpleasantly drafty in the winter or too hot in the summer. Your HVAC (heating, ventilation and air conditioning) system has to work overtime to overcome a leaky, underinsulated “building envelope,” so you pay extra to stay comfortable. Sealing air leaks and upgrading insulation levels as recommended by the U.S. Dept. of Energy can cut your heating and cooling expenses by as much as 40%. In an existing house, the most accessible areas for air sealing and insulation upgrades are the basement and attic. The work of sealing leaks and installing new insulation should be done by a full-service insulation contractor –a professional who can install different types of insulation based on location and application requirements. Installing a programmable thermostat. A great deal of energy (and money) can be wasted if your HVAC system is working to maintain comfortable temperatures when nobody is home or when people are sleeping. A programmable thermostat can be set to automatically reduce the call for heating or cooling at appropriate times. An HVAC contractor can help you select a programmable thermostat that best matches your HVAC system and the habits of family members. Since this energy-saving device is only as effective as you make it, make sure you understand how the thermostat works and how to program it properly. Also, don’t forget to override or reprogram the thermostat when you go on vacation or if your habits change. Sealing leaky ducts. Your ductwork system distributes “conditioned” air (air that you’ve paid to heat or cool) throughout the house. There are many connections and joints in a typical ductwork system, and many gaps, cracks and holes, too. On average, about 20% of your conditioned air is lost through leaky ductwork. 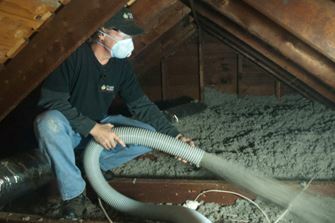 Sealing your ducts eliminates this wasted energy. For additional savings, insulate duct runs that are installed in unconditioned spaces like attics, basements and crawl spaces. Replacing incandescent light bulbs with CFLs or LEDs. Making this change is a no-brainer. You can expect to do some research before finding the right energy-efficient bulb to replace an old-fashioned incandescent bulb, but the payoff is worth it: a 75% reduction in the lighting portion of your electric bill. Replacing old HVAC equipment. Some folks may not see the need to replace a 25-year-old furnace that’s working perfectly. But it’s important to realize that even in tip-top condition, an older furnace is probably working at 65% – 70% efficiency. Modern “condensing” furnaces (and boilers, too) can operate at 90% efficiency and higher. If you plan to be in your house for another 5 years or longer, upgrading to high-efficiency HVAC makes good sense. Lower monthly utility bills aren’t the only benefits you enjoy when you improve your home’s energy efficiency. Research done by the National Association of Homebuilders reveals that “green” features like extra insulation and super-efficient HVAC systems are highly desired by today’s home buyers. Investing in energy efficiency will make your home more marketable, and can also enable you to up the asking price. A house that uses less energy protects you from future spikes in electricity and fuel prices. But more immediately, it will make your home more comfortable and healthier, too. Improvements like air sealing and duct sealing help to improve indoor air quality as well as energy performance.